Jonathan Kurtz, b. 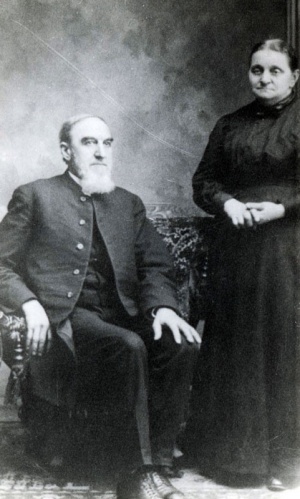 8 July 1848 near Lancaster, Fairfield County Ohio, d. 10 July 1930 in Mishawaka, Indiana, was a leading bishop in the Indiana-Michigan Amish Mennonite Conference, and the merged Mennonite (Mennonite Church) Conference. He was ordained preacher in 1882, and bishop in 1888, serving the Maple Grove congregation near Topeka, Indiana. He was an early and active supporter of progressive activities of all kinds, and helped in establishing missionary and educational work (Goshen College) in the activities of the church. He was married to Lizzie Byler on 19 March 1878. They had five children. Bender, Harold S. "Kurtz, Jonathan (1848-1938)." Global Anabaptist Mennonite Encyclopedia Online. 1958. Web. 26 Apr 2019. http://gameo.org/index.php?title=Kurtz,_Jonathan_(1848-1938)&oldid=113473. Bender, Harold S. (1958). Kurtz, Jonathan (1848-1938). Global Anabaptist Mennonite Encyclopedia Online. Retrieved 26 April 2019, from http://gameo.org/index.php?title=Kurtz,_Jonathan_(1848-1938)&oldid=113473.